Consider the dwarf goat if you're in the market for a caprine pet. Horned or naturally polled dwarfs are available. Dwarfism is considered a defect in a number of animal species, but that's not the case with the dwarf goat. They breed true when mated to other dwarfs. The terms "miniature" and "dwarf" are bandied about to describe breeds of smaller sizes, and sometimes used indistinguishably, though they aren't the same thing. Achondroplastic dwarf goats are "characterized by a nor­mal-sized trunk in combination with short legs and a broad, short head," according to the International Dairy Goat Association. Miniature goats are more proportionate. Two dwarf breeds, both from Africa, are common in the United States, although the history of how these goats came to these shores during the 20th century is somewhat murky. 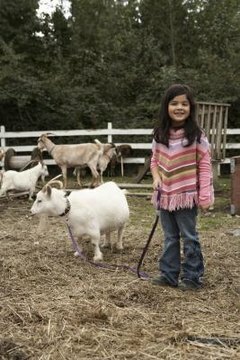 The Nigerian dwarf goat, which originated in Africa, weighs approximately 75 pounds at maturity, does and bucks weighing about the same. Bucks range from 19 inches to 26.5 inches high at the shoulder; does range from 17 to 22.5 inches. Does can produce a fair amount of milk relative to their size. Nigerian dwarfs come in a variety of colors; they have short to medium-length hair. Renowned for good disposition, Nigerian dwarf goats get along with other goat breeds and don't require separation as long as fencing adequately contains them. Also hailing from Africa, the African pygmy goat is easily distinguishable from the Nigerian dwarf goat. Less elegant than the Nigerian and slightly larger but not taller, the African pygmy goat as looking like "a beer keg with legs," according to Oklahoma State University's Department of Animal Science website. The African pygmy goat has straight, medium-to-long hair. The National Pygmy Goat Association breed standard permits black, caramel or agouti, which is a mix of black and white hairs. Goats may have certain white markings. These pygmy goats have outgoing personalities and strong constitutions -- they're tough, robust critters. They're also prolific breeders. According to the National Pygmy Goat Association, does can bear one to four young every nine to 12 months. Does can get pregnant as early as 2 months of age if they're not separated from bucklings. Because of their small size, dwarf goats are relatively easy to maintain. If you're planning on acquiring goats, purchase at least two. They are herd animals, much happier with company. Dwarf goats can live between 15 years and 20 years, so they're a long-term commitment. Make sure they have adequate shelter and shade, fencing at least 4 feet high, a constant supply of fresh water and good grass hay. You're good to go. International Dairy Goat Registry: Is the Nigerian Dwarf Goat a True Breed? National Pygmy Goat Association: New to Pygmy Goats?